Long have I been observing the way males interact with females, and vice versa. Some people are born shy and interact quite innocently. Others are bolder and interact with more ferocity. Still others are taken advantage of socially by demands and threats. Some people are kinder than others; some are meaner than others. Today, I have put together a new observation that has been many years in the making. The phrase "Nice guys finish last" is a common saying that evokes the belief that nice people are walked on, pushed over, and knocked down. Nice people, after all, are too meek and mild to resist the demands of their bossier counterparts. "To the victor goes the spoils." Nice people are simply too nice to be victorious in any situation, unless, of course, it is a competition of who can be the nicest. 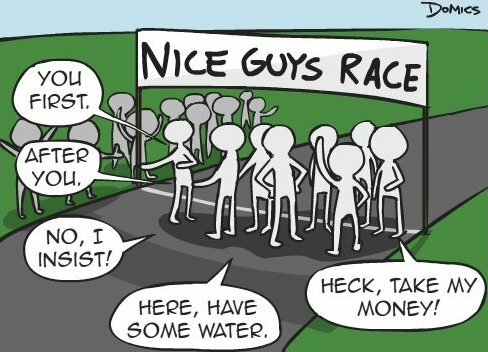 I know firsthand what it means to be a nice guy finishing last. I am generally against any form of confrontation. If it comes down to winning a game or losing a friendship, I will easily lose the game without any second thoughts in order to keep the friendship (unless that friend is my brother; I don't like to let him win...). Harmony is my goal. This desire for harmony and a genuine desire to be kind to others can leave me feeling used and abused sometimes. Many people look on this characteristic of being nice as weak. And honestly, I would agree with them, to a certain extent. Indeed, I have had to challenge myself to accept confrontation sometimes, usually when truth is challenged or someone is mistreated or bullied. Part of being a man is being a leader, and part of being a leader is battling for good, no matter how nice you want to be. "There is no peace without war," as the ancient proverb goes. On the other hand, being kind is a virtue often lost in today's world of bullies. In my world of niceness, I often think that I am the only one who feels as if he is walked on sometimes. Of course, that is not true. And today I suddenly became aware of the fact that the trait of being nice does not just affect men; it also affects women. I use this story to show that nice girls are often the victim of settling for less than they are capable of, simply because a "bad boy" gives them attention before the nice guy does. I noticed this today (and will now undoubtedly notice it all the time) when I saw a smart, generally nice girl being poked and sweet-talked by a vile bully. At first the girl playfully resisted him, but soon, not wanting any confrontation to ensue, gave in to his proddings and acted as if she enjoyed his touch. This both disgusts me and challenges me. First of all, it disgusts me because I see a girl who is nice give in to the pushiness of a guy who is far beneath her expectations and what she deserves. It literally makes me sick to my stomach. But it is a cycle that happens all to often, as I said before. A nice guy will certainly be left in the dust because nice guys don't give girls the direct attention that the other guys do. Thus, the girl's first interaction with a boy is one of disrespect by the guys who are not nice. This creates a cycle in that girl's mind during dating that says, "I guess this is what it's supposed to be like. I don't want to create any confrontation, so I'll do what he wants me to do because I love him and he says he loves me." Little does she know that there is a nice guy waiting and wishing that she would break up with him so he could show her how she should be treated, with respect and dignity. Second of all, this observation challenges me to love unconditionally even the most vilest of persons. Love is not always nice; love is sometimes dirty and even bloody. If you don't believe me, check out the story of Jesus in the Bible. God, out of His great love, sent Jesus, His Son, to earth to show us the extent of His love (John 3:16). Jesus came to die for everyone (John 3:16), and everyone has sinned (Romans 3:23). But Jesus loved us so much that He wore a crown of thorns on His head, took a Roman whip on His back, had nails hammered through His flesh, and hung on a cross for hours (John 18-19). Because He loved us. Because He loves me. Because He loves you! This is why this observation is so challenging to me. Christ died for me in my sin (Romans 5:8). Christ loved me in my sin; it is this kindness that leads me to repentance. And I am called to love as He did (I John 3:16). I am called to love others through their sin, even through their not-niceness. What a challenge! To all you nice girls out there: please be patient. Don't lower your expectations or your dreams of your knight in shining armor. Don't be afraid to be strong and say, "No!" when a guy is disrespecting you. Have enough self-respect to stand up for yourself. To all you nice guys out there: be strong and courageous. Get outside of your comfort zone and start confronting evil with kindness and love. And don't let fear govern your life. Take a chance. Be a man. You don't have to finish last. "Darkness cannot drive out darkness; only light can do that. Hate cannot drive out hate; only love can do that" (Martin Luther King, Jr.).